The role of media in collective action repertoires has been extensively studied, but media as an agent of socialization in social movement identity is less understood. It could be that social movement media is normalizing a particular activist identity to the exclusion of other demographics. For instance, Harper has identified white-centrism in anti-speciesist media produced by the Nonhuman Animal rights movement and supposes that this lack of diversity stunts movement potential. Using the lesser-studied Nonhuman Animal rights movement as a starting point, this study investigates two prominent Nonhuman Animal rights magazines. We compare those findings with an analysis of comparable leftist movements also known to exhibit diversity strains. A content analysis of Nonhuman Animal rights, women’s rights, and gay rights magazine covers spanning from 2000 to 2012 was undertaken to determine the manifestation of gender, race, body type, and sexualization. We find that the Nonhuman Animal rights media in our sample overwhelmingly portrays white women with a tendency toward thinness, but with low levels of sexualization as comparable to that of the other movements. All three movement samples unevenly depicted gender, overrepresented whites, and underrepresented non-thin body types. Wrenn, C. L., & Lutz, M. (2016). White women wanted? 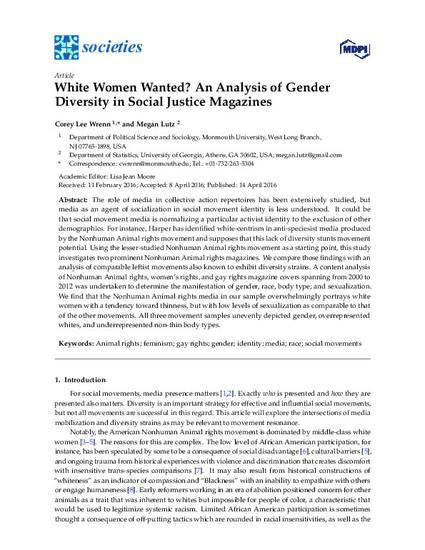 An analysis of gender diversity in social justice magazines. Societies, 6(2), 12.